A delegation of IT Teachers met Chief Minister Prem Kumar Dhumal and apprised him about their grievances. While talking to them, Chief Minister Prem Kumar Dhumal claimed that sincere efforts had been made to benefit each and every section of the society by rising above political consideration. Chief Minister said that State Government had carried out uniform and balanced development and implemented the poll promises made in the election manifesto. He said that a number of schemes which had no mention in manifesto had also been implemented for the benefit and welfare of the people of the State. 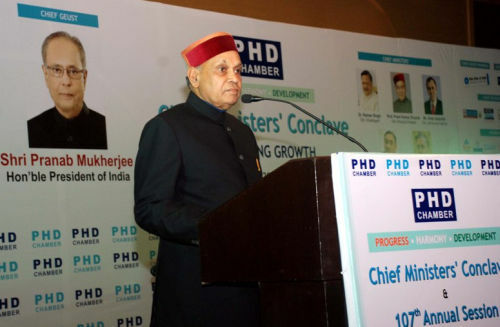 Prof. Dhumal said that the Government was indebted to the employees of the State for their valuable contribution in implementation of polices and programmes in the farthest corner of the State which had resulted in to desired out come. He said that the State was poised to gain new heights on development front in coming years where employees would be playing significant role. Chief Minister said that after considering the demands of IT Teachers in Cabinet State Government had constituted a committee under the chairmanship of Chief Secretary.